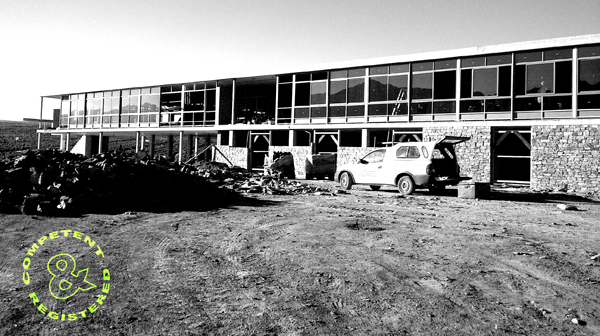 A first-of-its-kind, the FynBloem Sustainable Protea Packing Facility in Riviersonderend by KUBE architecture. Cape Town based architectural practice, KUBE architecture is now capable of acting in the capacity of Competent Persons with regard to the new SANS10400XA Energy legislation. What this means is that we are able to perform Rational Designs according to the Regulation and Standards, and make use of the Deemed-to-Satisfy route for compliance. Option 1: Rational design: This alternative requires input of a professional “competent” person and involves calculating the Thermal performance of the building, which should be equal to or better than a theoretical building that complies with SANS 10400:XA. Option 2: Compliance with the requirements as specified in SANS10400XA. Option 3: Compliance with the requirements of Table 2(Energy Consumption) and Table 3(Energy Demand) contained within SANS10400:XA, which involves calculating the Thermal Performance, Max Energy Consumption and Max Energy Demand according to SANS204. The input of a professional “competent” person is required. Option 4: Comparison with a compliant theoretical (reference) building: The theoretical max energy consumption and demand shall be less than or equal to that of a reference building as measured with thermal performance calculations software accredited by Agrement SA. The building should be designed according to the deemed-to-satisfy requirements. The local authorities now require that all building work complies with these requirements and that a competent and registered person submit plans for all proposed building work. Where provided the competent person must specify the location, type and capacity of water heating installations(50% of hot water required is to be provided by non-electrical resistance sources and all exposed hot water piping to be insulated with an R-value of 1).Details of all fenestration and relevant insulation must be clearly indicated. After building work is complete a competent registered person will also need to certify the building as energy compliant in order for the client to obtain an occupation certificate. Feel free to contact KUBE architecture should you require any further information. This entry was posted in Fynbloem, Green Building, Sustainability and tagged architect, architecture, design, Green Building, KUBE architecture, sustainability on July 2, 2012 by KUBE architecture.